Phaedra Pezzullo’s Toxic Tourism: Rhetorics of Pollution, Travel, and Environmental Justice is already a must-read for those interested in waste studies, justice, and the methods of making invisible waste manifest through various communication techniques. A new article by Tom Bowers takes up the issue of visualizing waste as an integral part of advocay with “Mountaintop Removal as a Case Study: The Possibilities for Public Advocacy through Virtual Toxic Tours,” in Environmental Communication. This paper argues that geo-spatial technologies (GST) such as Google Earth and Google Maps offer the potential for environmental advocates to generate virtual toxic tours. 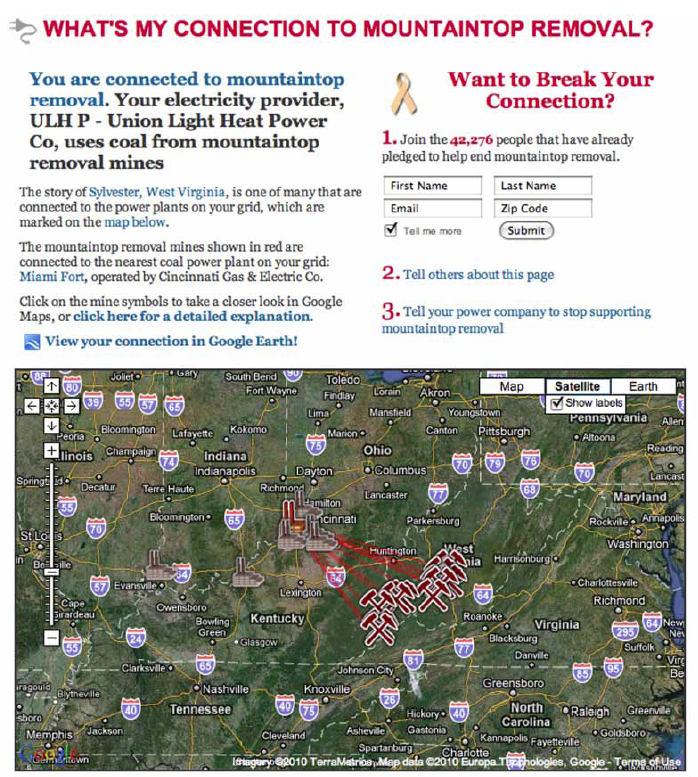 By analyzing the use of GST by I Love Mountains, a coalition of organizations attempting to stop the practice of mountaintop removal, this paper illustrates how a virtual tour generated through GST such as Google Earth can be a means to generate presence and promote identification between those local residents impacted by the practice and those who inhabit places seemingly distant from the same practice. The study not only acknowledges the limits of virtual tours but also identifies specific qualities not evident in tours of physical environments. Due to the potential virtual tours, this study also seeks to prompt further consideration of the use of GST and their role in contemporary environmental advocacy efforts. This entry was posted in Activism, Aesthetics, Environment, Justice (EJ), Technology. Bookmark the permalink.